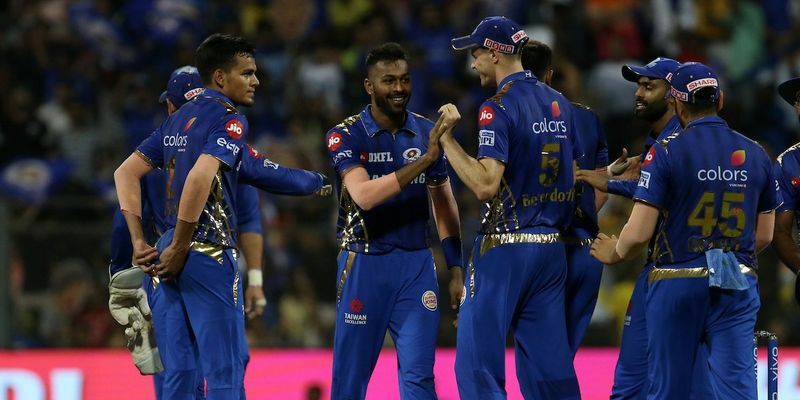 Hardik Pandya’s cameo of 37 from 16 deliveries helped Mumbai Indians gun down Royal Challengers Bangalore’s total of 172 with six deliveries to spare. Mumbai Indians batsmen were outstanding as the surface started to turn, but the top order had kept them in good stead for the late surge. Rohit Sharma (7.5/10): Rohit Sharma’s return from injury has been impactful as he seemed to be in a different zone altogether. While chasing a massive target, MI needed their openers to fire and get a solid start and Rohit ensured his willow spilled fire on this occasion. It was vintage Rohit - he pulled fearlessly, cut graciously and drove magnificently on his way to 28. Rohit and de Kock at the top is like a double-edged sword. Quinton de Kock (8/10): The South African opener is known for his belligerence at the top and there were no half measures when De Kock decided to take on the bowling attack. He looked a little tentative initially, but soon found his rhythm and picked gap wisely, a trademark of a top-level batsman, to score a classy 40. Suryakumar Yadav (6.5/10):MI have incredible strength when it comes to Indian batting power; and players like Suryakumar Yadav, Ishan Kishan, Hardik and Krunal Pandya corroborate the belief. With the ball turning so much, it was important to not let the bowlers settle down, which Suryakumar did with perfection and managed a steady 29 off 23 balls. Kieron Pollard (6.5/10): Pollard accounted for a brilliant run out of AB de Villiers, which eventually resulted in a deficit of 10-12 runs in RCB’s total. He didn’t have a lot of job to be done with the bat as Hardik went berserk and finished off the game in the 19th over. Hardik Pandya (8.5/10): There is some swag the moment Hardik Pandya is in action. MI needed a wicket desperately; Rohit Sharma summoned his lieutenant Pandya and the all-rounder responded with a wicket. His three overs didn’t leak a lot of runs and was right on the money. Hardik continues to haunt bowlers with his aggressive batting, which was a fine combination of brute force and finesse. The target looked like a cake-walk the moment Hardik started hitting those monstrous sixes. Ishan Kishan (7.5/10): Momentum swung in the favour of RCB after Moeen Ali wreaked havoc in his very first over. Kishan was not going to be bogged down by this; he broke the shackles with some counter-attacking and brought MI back in the game. But MI would be wanting Ishan to turn his cameo into big scores. Krunal Pandya (2.5/10): Krunal Pandya is one wily customer who is known to make breakthroughs and score cheeky runs, but today was not his day. He bowled just a solitary over where he leaked 10 runs and the strike rate with the bat was just poorer. Rahul Chahar (7/10): The young Indian talent has been impressive with his leg-spin. He dares to experiment and isn’t scared from pitching it up. He got some turn straight away and bowled with good control. Chahar’s attitude is what impressed the most; he looked right into the eyes of the batsmen and always up for a battle. Jason Behrendorff (4/10): Produced an excellent first two overs with the new ball to get rid of the big fish Virat Kohli. It’s not everyone’s cup of tea to trouble Kohli with sheer line and length, but Behrendorff displayed some immaculate control and got the ball to move into the right-hander. Behrendorff leaked ample of runs in his next two overs, where he became very predictable with his length and pace. This is where the Australian pacer needs to pull up, who has also been drafted into the Australian World Cup squad. Lasith Malinga (8/10): The Sri Lankan hero was roped in as a replacement for Alzarri Joseph and he proved his worth with a bang. Malinga brought his plethora of experience into play and chipped four wickets to put RCB on the back foot. Mumbai’s most experienced player mixed up his pace very well and kept the batsmen on the toes, and barring de Villiers, not many batsmen managed to score against him. Jasprit Bumrah (8.5/10): He belongs to that rare class of bowlers who are equally effective with the new as well as old ball. If movement is his forte with the new leather then toe-crushing yorkers are his strength in the death. He troubled De Villiers in his first two overs and continues to show why he is the best white bowler in contemporary cricket. He was oozing with confidence and watching him put in the hard yards was a joy to behold.